Guwahati, Dec 16 : Mizoram’s mandate 2013 appears to have restated a reality — the romanticism associated with rebels in the Northeast is wearing off. The second successive poll rout of the Mizo National Front (MNF), though partially attributed to a Congress pro-poor scheme, has indicated that the ‘hangover’ of 1966 might not be working on a young, outward-bound Mizoram. A group of famine relief workers-turned-rebel outfit, the MNF fought a war of liberation against the Indian armed forces since 1966. It transformed into a political party after inking a truce with New Delhi in 1986. Lal Thanhawla, who headed the first Congress government in 1984, stepped aside for MNF supremo Laldenga, who became chief minister in 1986. Later, Laldenga’s lieutenant Zoramthanga helmed the MNF government from 1998 to 2008. The MNF’s loss in the 2008 polls was attributed to anti-incumbency. But the defeat of Zoramthanga in two seats — of other senior party leaders with an ex-rebel tag — was not lost on many. Zoramthanga changed his constituency this time for a change of fortune but a Congress newcomer beat him comfortably. What also did not work for the party was its ‘Mizo nationalism’ plank, a throwback to the militancy days when ‘India’ was viewed as colonial power and national parties such as Congress labelled ‘vaipawl’, meaning organisation of outsiders. “The past no longer seems to be working for the MNF, though it has a chance of coming back if the Congress falters. The MNF will have to reinvent and repackage itself as a party of a progressive state and even go for a leadership change, preferably with younger people with fresh ideas,” Lallianchunga, assistant professor of Mizoram University’s political science department, said. The profiles of three of the MNF’s five winners this time are indicative of the changing mindset. Lalrinawma, Lalruatkima and K Beichhua were minors when the MNF was past its prime as a militant outfit by 1972. Two months before the Mizoram polls, people in Nagaland confronted the rebels for extortion in the name of ‘revolutionary taxes’. 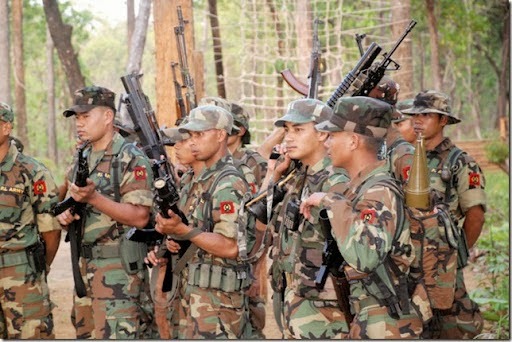 Such defiance against the armed cadres of six Naga groups was unthinkable earlier. The two major Naga outfits on ceasefire mode — the Isak-Muivah and Khaplang factions of the National Socialist Council of Nagaland — allegedly influence politics in the state and control the party or coalition that heads the government there. The story is similar elsewhere in the Northeast, whether or not rebel groups evolved into political parties. The United Liberation Front of Asom is virtually a spent force, living in the past as far back as 1826, when the British annexed Assam. In Tripura, the Indigenous Nationalist Party of Twipra (INPT) has gone nowhere with its credo of taking the state back to its pre-1947 status of tribal rule. Headed by former guerrilla chief Bijoy Kumar Hrangkhawl, the INPT won six of the 20 seats across Tripura’s tribal belt in its first assembly elections in 2003. In 2008, Hrangkhawl was the party’s lone winner but he too bit the dust in 2013. Likewise, some leaders of the disbanded Dima Halam Daogah were rejected by voters in Assam’s North Cachar Hills Autonomous Council polls earlier this year. The only political entity that is dominated by ex-rebels and which seems to have stemmed the tide is the Bodoland People’s Party. An ally of the ruling Congress in Assam, it has been lording over the Bodoland Territorial Council (BTC) since its creation in 2003. But the BTC’s story has been that of fratricide — those in power have allegedly retained their arms to wage period wars against rival political and militant groups — and communal violence, the kind that saw 108 people, most of them migrant Muslims, being killed last year.